We decided to apply 6 days before the closing date, ran round manically, failed, and then found they'd increased the closing date by 2 weeks. 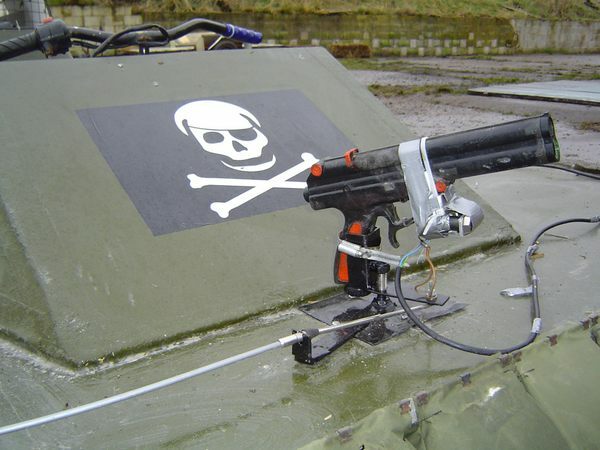 We planned to use some unused hovercraft ironmongery to make a remote fire paintball gun on the front of the hovercraft as we had intended for a long time. The plan was nearly abandoned when we initially couldn't find a paintball gun. 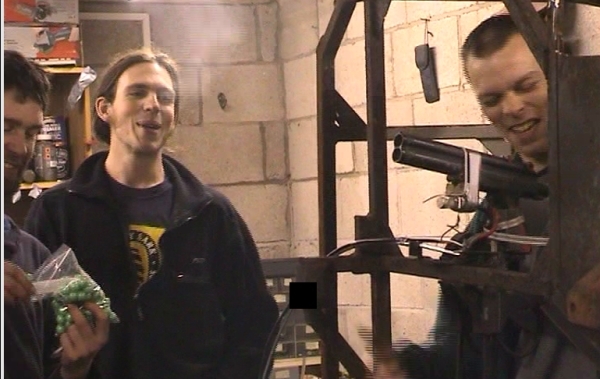 To enter for ScrapHeap Challenge, you have to make a video introducing yourselves, and then make or explain something. These images are from the video. 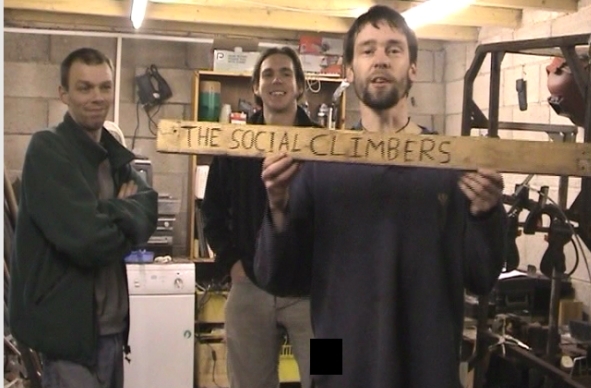 The "usual" suspects are Pete, Big Al and me, from the Salford University Mountaineering Club. We made it, and it works. I have to admit to being someone cagey about pete making a solenoid, but it really works, rather well. The wires get a bit warm if you use it too much, but what the hell. Everything in the garage is now covered in green paint. 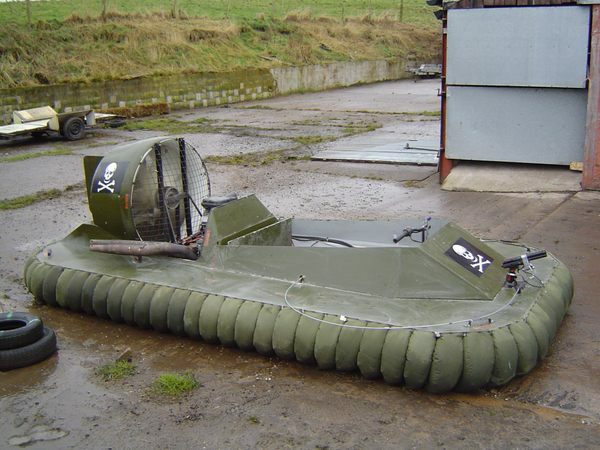 Here it is, fitted to the hovercraft. I think it sets off the flag beautifully, and finishes the tank theme. 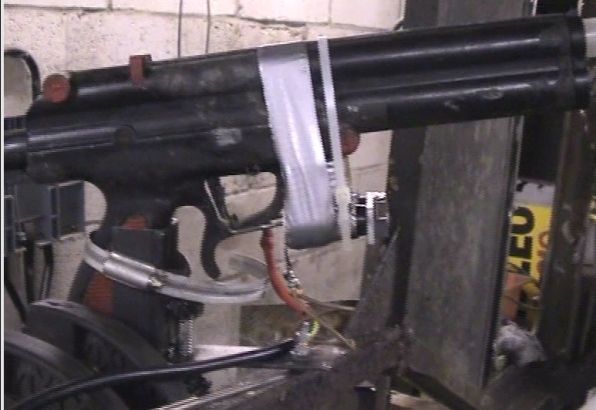 Since we've discovered that semi auto paintball guns are about £50, we're going to get one - this one has to go back to the owner. I will, of course, let you know how we get on!